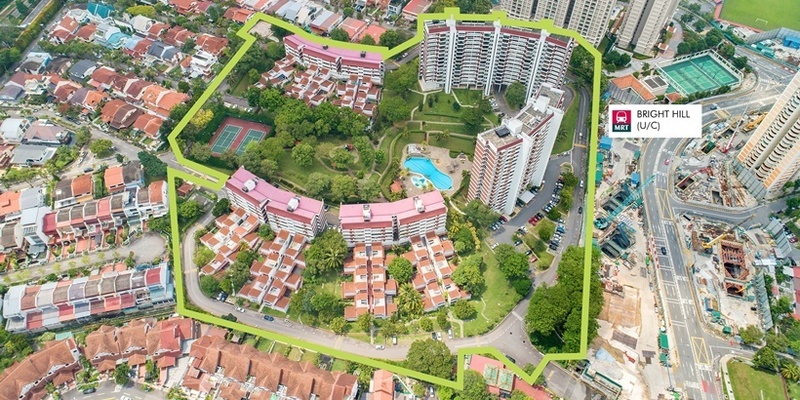 Faber Garden, a 236-unit freehold development at Angklong Lane off Upper Thomson Road, has been launched for en bloc sale with a reserve price of $1.18 billion, marketing agent CBRE said on Monday (16 Apr). Inclusive of the development charge, the land price works out to $1,414 psf per plot ratio (psf ppr), or a lower $1,342 psf ppr if the 10 percent bonus balcony space is included. The development charge for the 544,738 sq ft site is about $52.8 million, or $106.7 million if the 10 percent bonus balconies gross floor area (GFA) is included. Located next to Singapore’s Central Nature Reserve and close to the upcoming Bright Hill MRT station on the Thomson-East Coast Line, the site is zoned for residential use under the 2014 Master Plan with a plot ratio of 1.6 and a height limit of 12 storeys. It has a maximum allowable GFA of about 871,581 sq ft, or 958,739 sq ft if the 10 percent bonus balconies are taken into account. The site could yield more than 1,150 units based on an average home size of 753 sq ft.
“In land scarce Singapore, large sites such as this are hardly available, or would otherwise be 99-year leasehold. Faber Garden’s attributes are exceptional – the plot is freehold; it is next to a nature reserve, and an MRT station at its doorstep makes it a compelling development proposition,” said CBRE capital markets executive director Galven Tan. If the sale goes through, Faber Garden will become the largest en bloc sale this year, beating Pacific Mansion, which was sold for $980 million in March, reported Channel NewsAsia. The tender exercise will close on 23 May.